Fun-filled one day outdoor concert event at the best bar in McHenry County, The Cottage Pub!! 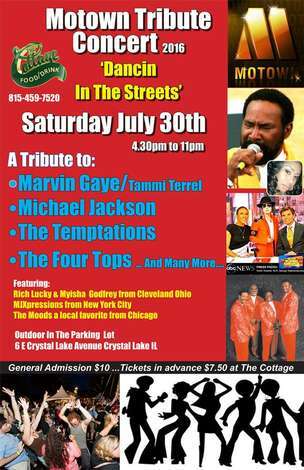 Tributes to Marvin Gaye, Michael Jackson, The Temptations, The Four Tops and many more!! VIP Passes only $50 for open bar and buffet in VIP tent! Be sure to wear your dancin' shoes!